A hundred years ago half the population in parts of south China was working in the booming silk industry. The land was covered with mulberry trees producing leaves to feed the silkworms. Like most trees -- perhaps even all trees -- mulberry trees (Morus alba) have many further uses. In "Tree Crops: A Permanent Agriculture" (ISBN 0-933280-44-0, 1950), American researcher J. Russell Smith writes that mulberry trees provide high-quality harvest-free feed for pigs and chickens. He quotes the case of a small farmer in North Carolina who kept pigs and claimed that one-third their weight was due to the mulberries falling from his trees -- about 625 lb of pork to an acre of "rather thin, sandy land with little care and no cultivation". Russell Smith says mulberry trees are cheap, very easy to propagate, easy to transplant, they grow rapidly, start fruiting almost immediately, have a long fruiting season and don't need harvesting. The leaves can also be eaten as a vegetable and make a nutritious feed for dairy cattle. "Those of us who have seen solid coats [of mulberry fruits] on the ground realize that there is a lot of sugar there that could be converted to alcohol." He also cites work in South Korea on producing high yields of ethanol from mulberry tree sawdust by acid hydrolosis. Mulberry is also a widely used traditional folk remedy, used for "aphtha, armache, asthma, bronchitis, bugbite, cachexia, cold, constipation, cough, debility, diarrhea, dropsy, dyspepsia, edema, epilepsy, fever, headache, hyperglycemia, hypertension, inflammation, insomnia, melancholy, menorrhagia, snakebite, sore throat, stomatitis, tumors, vertigo, and wounds" (Duke and Wain, 1981). Japanese sculptor Isamu Noguchi used "shoji" paper made by hand from boiled mulberry tree bark for his famous Akari lamps, now regarded as pure modernist sculpture (there's a permanent exhibition of them in the Museum of Modern Art in New York). 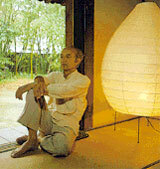 Noguchi was inspired by the traditional rice-paper lamps used by Japanese fishermen for night fishing. Mulberry bark is also used for paper in Europe, and in Polynesia it is used to make a fabric called Tapa cloth -- an ancient craft that is now helping to save rainforests in the region. New Guinea has the largest remaining tropical forest in the Asia/Pacific region, but it is under severe threat from industrial logging. The Maisin people of Papua New Guinea have rejected proposals from the big timber companies to sell their one million acres of ancestral rainforest. Instead, they have resolved to build their livelihoods from more sustainable practices, such as making and selling their traditional Tapa cloths, made from mulberry trees grown in their gardens. Green groups are helping the Maisin to find a worldwide market for their products. 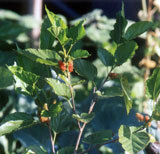 Mulberries have been adapted to a very wide variety of local conditions. Japan has about 700 different types. The trees can grow from cool temperate to warm tropical regions, from dry to moist areas, from sea-level to as high as 3,300 metres. Mulberry trees grow well in containers -- we planted a mulberry cutting in an old bathtub in our organic garden at our headquarters at the Beach House on Lantau Island. It was fruiting within weeks. Mulberries are attractive trees, and the fruit is delicious. "Chinese Methods for Integrating Fish Culture with Crop and Livestock Farming" -- Integration of fish, livestock, and crop production in China has been refined for over 2,000 years. The system recycles resources, reduces organic pollution (livestock and poultry manure are good organic fertilizers for fish farming), and combines fish farming with mulberry cultivation for raising silkworms. The silkworm pupae are used as fish feed, and the worm faeces and wastewater from silk processing as pond fertilizers. Pond silt is used as fertilizer for fodder crops, which can in turn be used to feed livestock, poultry, and fish. All about mulberry trees, from the California Rare Fruit Growers, Inc. Even more about mulberries from James A. Duke's "Handbook of Energy Crops" (1983, unpublished), at the Center for New Crops & Plant Products, Purdue University, Indiana: Uses, Folk Medicine, Chemistry, Description, Germplasm, Distribution, Ecology, Cultivation, Harvesting, Yields and Economics, Energy, Biotic Factors, References. Yet more about mulberry trees, from "A Modern Herbal", by Mrs. M. Grieve, originally published 1931. Interesting on history of mulberries, especially in Ancient Greece and Rome, and England: King James 1's famous edict promoting the widespread planting of mulberries to encourage English silk production -- only he got the wrong tree! Hence the lack of English silk. Shakespeare's famous mulberry tree, the sad fate thereof. 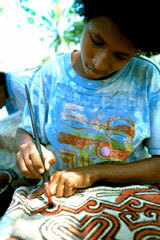 Painting a Sustainable Future: Maisin Art and Rainforest Conservation in Papua New Guinea -- Image Gallery, Maisin Tapa, Background, at CorpWatch. Larry Rinder reports on a journey to the Maisin villages.